Videos, Read Alouds, Science Songs, and Vocabulary Photo Cards reinforce key science vocabulary and core science concepts in a fun and easy-to-use format. GLANCE through differentiated instruction ideas, GRAB the ones you like, and GO to class prepared! Lessons are customized to fit your classroom needs! 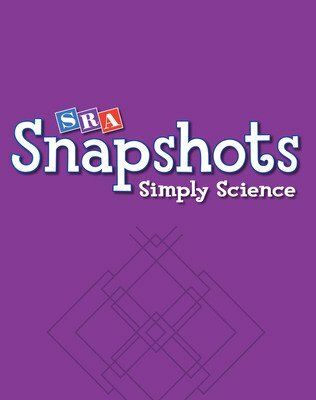 SRA Snapshots Simply Science, written by Dr. John Lucas, provides quick and easy tools that allow you to integrate science concepts into your classroom. This program differentiates instruction, enhances literacy skills, and uses technology to reach different learning styles. With our exclusive SHR Science Learning Approach, no matter what the learning style, your students learn the basic science concepts and key vocabulary they need to be successful in today's science classroom. With SRA Snapshots Simply Science, your students see science through our fast-paced video lessons that build background knowledge using audio in both English and Spanish and visuals. Paired fiction and nonfiction read-aloud books come to life in the digital version with audio available in English and Spanish. This helps transition students from fun narratives to informational texts while teaching core science concepts. Through the corresponding science songs audio CD in both English and Spanish, students are able to familiarize science concepts and vocabulary with unique tunes and lyrics. The unique format allows the teacher to provide quick and easy lessons that meet the needs of different learners and provide an opportunity for students to apply concepts through hands-on science activities. The Teacher Kit includes everything needed to support your students' learning: Video DVD, Digital Read Aloud CD-ROM, Read Aloud Books (9 per pack), Vocabulary Photo and Routine Cards (95 per level), Science Songs Audio CD, Teacher's Idea Book, Teacher Resource CD-ROM, and a convenient carrying case.